In this space we recently covered a new political party in Germany dedicated to discarding the euro. But what happens when the same thing happens from the other end of the EU’s economic spectrum? Yes, you see “Beppe Grillo” there in that tweet, which is written in Italian, and it’s certainly true that Grillo’s “Five Star Movement” is anti-euro. 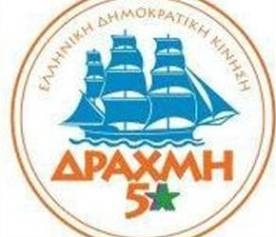 But I’m talking here about a new Greek party, one that was registered by the Athens authorities only last May 2, namely the “Drachma Five Stars Democratic Movement” which in its very name pays homage to Grillo’s Cinque Stelle (= “Five Stars”) movement. 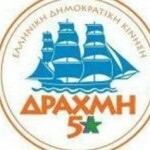 This piece by Gabriele Vallin in the Huffington Post’s Italian edition does not indicate how much popular support this “Drachma 5-Star” party has attracted, but again, it’s brand-new. It does feature an interview with the party’s founder, Theodore Katsanevas, Professor of Labour Economics at the University of Piraeus. The interview is brief, but action-packed. Not only does the Professor urge a Greek exit from the euro, he envisages uniting with the other Southern European member-states in trouble (Italy, Spain, Portugal, Cyprus) in an alliance of euro-leavers (not that they would then share a common currency between them; each would return to its former national currency). This is presented as simply a collective exit out of the Eurozone, not out of the European Union itself, although then he also calls for an “autonomous economic zone” encompassing the non-Islamic Mediterranean (including Malta and Israel), which does sound rather secessionist. He dismisses the recent upgrading of Greek sovereign debt by the Fitch rating agency as a German trick for Chancellor Merkel’s upcoming re-election campaign. And he estimates that the new drachma would need to stand in a 2-to-1 relationship to the euro – so that’s a halving of purchasing power for any Greeks foolish enough to keep their euros in banks under Greek government control when the change-over is made. In any case, and just as in Germany, explicit political groundwork has been laid for a euro-exit in the form of this single-issue party. And as we can see from a very revealing chart tweeted by David Enrich, itself taken from a recent piece in the Wall Street Journal, it’s reasonable to ask just how much more economic hardship Greece can take.